By Bay Area Bird HospitalApril 24, 2017Feathers, Furs, and Scales! During a recent conversation with a client, I recommended she measure the pellets offered and make sure they are no more than 1/4 cup (for a rabbit). She asked me “which size cup?”. I was very confused. Sometimes I feel the most difficult part of the job is communication. I didn’t know how to respond to the client – finally I suggested a dry measuring cup. She still seemed confused and was happy to learn that measuring cups are standard sizes. I recommended she go out to a store with kitchen supplies and get a fresh set. I’ve been told stories, by dog and cat vets, that when asked to bring in the cup used to measure their pet’s food an owner brought in a 7-11 big gulp! 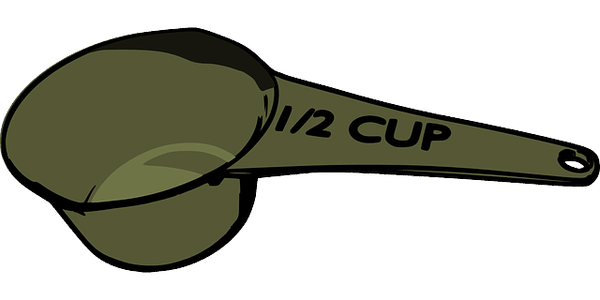 That is, technically, a cup – if you assume cup is referring to the container rather than the measurement. At least we each learned something that day – she learned how measuring cups work and I learned that some people haven’t been taught how measuring cups work.